Cyphastrea are sometimes referred to as a Meteor Coral however most reef aquarists today simply refer to them by their scientific name. The most common color variant of Cyphastrea is a blue base with red polyps called a Meteor Shower Cyphastrea. 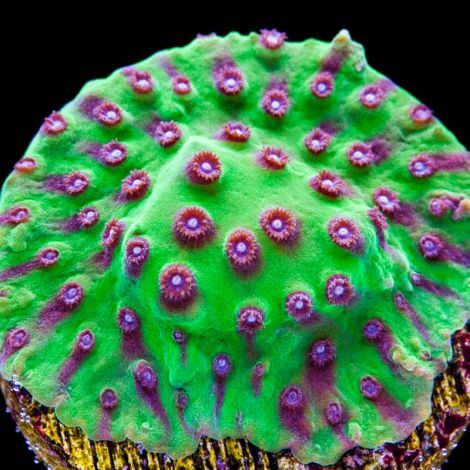 It turns out though that there are many rare color variants of this beautiful coral that are every bit as spectacular. Cyphastrea are a very low light coral and do poorly when exposed to high light. In our systems at Tidal Gardens, we try to find the dimmest locations to keep them.